As from today, the supporting documents digitalised by Captio have legal validity in Italy. 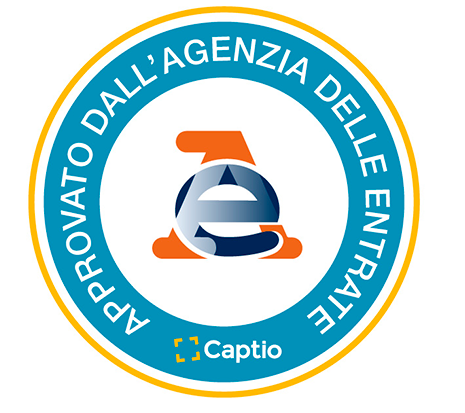 The Agenzia delle Entrate has approved the digitalisation process that certifies that Captio’s captures comply with the legal regulations of this country. The Agenzia delle Entrate (AdE) has validated the Captio digitalisation process. This means that, from now on, supporting documents and receipts digitalised with the expense management platform are legally valid according to Italian regulations. Italian law requires companies to keep the original supporting documents for a minimum period of 5 years, unless they are digitalised using a method accepted by the AdE. For this reason, as from now, all users of Captio will be able to discard the paper invoices while fulfilling this requirement. The AdE has audited the process and has issued a favourable opinion on Captio, which makes it the first platform specialising in expenses management to receive the approval of the Italian Tax Office. Upon being legally accepted, the approval gives Captio legal validity in the Italian market. “Being the first travel expense management software to receive a favourable opinion from the AdE is fundamental to offering the best service to the Italian market,” explains Joel Vicient, co-founder and CEO of Captio. This thus closes the cycle and allows us to consider the entire process of company expenses management fully digital, from the report to the accounting. In addition to digitalising the document, simply by taking a picture of the receipt, the application's automatic reading system uploads the data from the supporting document to the cloud and prepares them for when you want to make the expense report from a smartphone or computer. Thanks to our solution, in the other part of the expenditure monitoring chain, the Department of Finance or Administration will receive the reports on time, sorted and fully digitalised. In addition, Captio can be integrated into the accounting system to make the accounting of expenses even easier. Thus, a traditional and manual flow of reports and supervision is transformed into an entirely digital and automated process. Thanks to the favourable opinion of the Agenzia delle Entrate, forgetting about paper in the management of business expenses in Italy is already possible with Captio’s digital solution.